Medusa: NEWS FLASH !!! CHICKEN LADY RIDES AGAIN !!! Well, it sure didn't take long for Bonnie Luper (aka Chicken Lady) to get her MAGIC CHICKEN DIET back online! 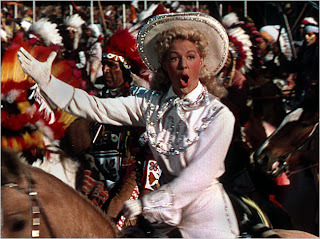 *Photo: Betty Hutton as Annie Oakley in "Annie Get Your Gun," (1950). If the site is legitimate, I do hope they remove all resemblance to the Kimkins site AND the diet!